By Clemente Lisi – NEW YORK, NY (Nov 27, 2017) US Soccer Players – Major League Soccer has had its ups and downs over the years. From national TV ratings that have struggled to grow to stadium attendance that has, MLS can point to many failures and successes. Expansion is another area where MLS can point to positives, but even that success story has run into one outstanding issue in Columbus. The 2017 season is shaping up to be one of many successes and failures. Stadium attendance continues to rise. MLS averaged 22,000 for the first time this season. TV ratings remain largely low, with MLS games drawing under 300,000 per game on national broadcasts. It's a contradiction the league is still trying to remedy as the club game slowly gains mainstream acceptance. Missing the 2018 World Cup looms large for a league tasked with developing American talent. It has inadvertently also boasted the fortunes of other CONCACAF nations such as Costa Rica and Panama, who did both qualify for Russia 2018. How has MLS changed since 2007? Comparing the current season with what took place a decade ago, a time when the league was really starting to come into its own after the 1996 inaugural season, highlights that basic issue. There are certainly gains, but there is also plenty of room for growth. The biggest legacy of that ’07 season is Beckham. His arrival at the Galaxy made it so that foreigners no longer regarded MLS as a “retirement league.” While many had slapped that label on MLS and Beckham's motives at the time for wanting to leave Real Madrid, Beckham did eventually help turn the Galaxy into a powerhouse. Coupled with Robbie Keane, one of the best DPs to ever play in the league, and Landon Donovan, the team went on to create a dynasty. Los Angeles would go on to win back-to-back MLS Cups in 2011 and 2012, Beckham’s final season in LA, while winning another with Donovan and Keane in 2014. This season, MLS had 57 DPs spread out among its 22 teams. Beckham’s transformative moment paved the way for others. Big names have indeed followed Beckham, including Theirry Henry, Rafa Marquez, and Obafemi Martins. Some were great – like Henry – and others were a bust – like Marquez. Others were good, such as Martins, but left too early to leave any lasting impact. The positive outcome of the DP Rule is that players have gotten younger. Sebastian Giovinco, who came to MLS in 2015 at age 28, is one reason why Toronto FC is so unstoppable. Atlanta United’s three DPs this season – Miguel Almiron (23 years old), Hector Villalba (22), and Josef Martinez (23) – are all in the prime of their careers. It was in 2005 that the league granted permission to the Anschutz Entertainment Group to move the San Jose Earthquakes to Houston. 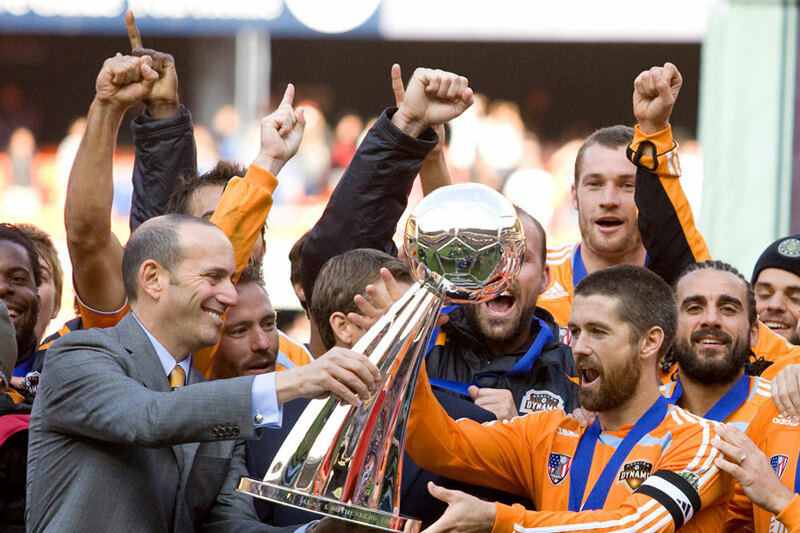 In their debut season in Texas, the Dynamo won the 2006 MLS Cup. Houston beat the New England Revolution 4-3 in a penalty shootout following a 1-1 draw, in an effort spearheaded by Canadian star Dwayne De Rosario and US internationals Brian Ching and Stuart Holden. The team won the title again in 2007, defeating the Revs once again, with De Rosario scoring the game-winning goal in a 2-1 victory. The Dynamo remained competitive for a few more seasons. They lost the MLS Cup Final in 2011 and 2012 to the Galaxy. Since then, there was a slide into a familiar position for former MLS powers. They missed the playoffs in three consecutive seasons. Things changed this season under coach Wilmer Cabrera. The Dynamo finished fourth in the Western Conference with a 13-10-11 record. The Dynamo now needs to overcome a 2-0 deficit to the Seattle Sounders in the second leg of the Western Conference finals on Thursday to continue their unlikely run. 2017: TFC on the verge of winning its first MLS Cup? Some already believe that the 2017 version of Toronto FC is the best team to ever play in MLS. That's even without knowing if they'll lift the title. Ten years ago, Toronto was an expansion team. The club’s first win on May 12, 2007 at BMO Field, one of the first soccer-specific stadiums located in a city’s downtown, featured fans tossing seat cushions on the field with an excitement that wouldn't match the team’s abilities. The first Canadian team in MLS had its ups and mostly downs. It took until 2015 for them to make the playoffs. In 2017, Toronto amassed 69 points after posting a 20-9-5 record. US striker Jozy Altidore got back into the scoring groove, while Giovinco’s free kicks and passing abilities made the TFC attack both fluid and amazing to watch. The Reds are on pace to win the treble. That's the Canadian Championship, Supporters’ Shield, and MLS Cup. They only need that final trophy, playing Columbus on Wednesday in the second-leg of a scoreless Eastern Conference final series. After making the MLS Cup final last season, anything short of the trophy would be a surprise. That's how good Toronto is right now, pushing to become the first Canadian MLS champion.